photo courtesy of Hemnes Turistforening, all rights reserved. 29th January 2014 – The breathtaking beauty of Norway’s far north now has a first-rate new facility to welcome adventurers to the magnificent Okstind glacier. 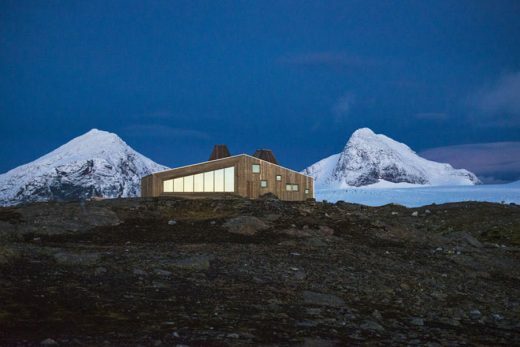 Commissioned by the Norwegian Trekking Association (DNT) and designed by Jarmund/Vigsnæs Architects (www.jva.no), the remote ‘Rabothytta’ cabin has been built to precise specifications to withstand the harsh extremes of weather in the region. Designed to echo the natural forms of its landscape, it is part of a network of self-contained cabins and can accommodate groups of up to thirty people on a self-catering basis. in the construction to ensure a wind-tight envelope that is protected against moisture while allowing vapour to diffuse. 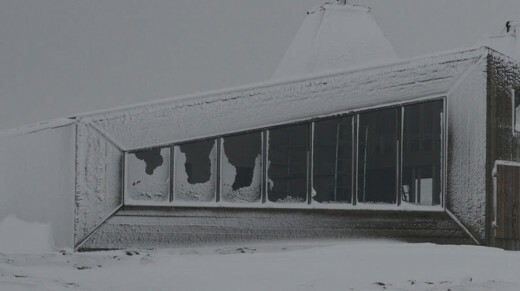 DuPont™ Tyvek® breather membranes for buildings have been specified for the remote new ‘Rabothytta’ trekker’s shelter, situated at 66 degrees north, 1200 metres above sea level and 60km south of the Arctic Circle. The elegant yet rugged architecture of the cabin consists of a timber frame and asphalt board structure with concrete foundations and a façade of 32mm local spruce blanks in a natural finish. Spruce also clads the interior walls and forms the cabin floor, while DuPont™ Tyvek® Soft seals the interstitial envelope, protecting the hut both during and after the construction process. The large ‘viewing’ windows are made from two layers of glass with a further layer of 13mm toughened glass to the exterior, supplied by local manufacturer Trenor AS. The pitched roof structure features Kerto timber rafters with insulation, wrapped in DuPont™ Tyvek® Supro Grid as an airtight wind and moisture barrier – a crucial element to guard the build until completion and to enhance interior comfort once occupied. Further protection is provided by Isola Isokraft, an extremely tough asphalt membrane covered with a finish of Kebony timber planks. 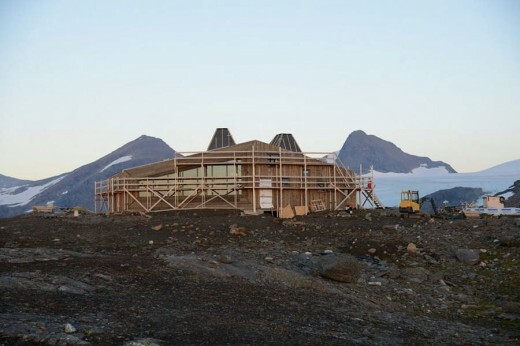 Situated at 66 degrees north, 1200 metres above sea level and 60km south of the Arctic Circle, the cabin benefits from all the natural beauty of its surroundings yet is sheltered from its exposed location by the best that modern building technology can offer. Designed for maximum efficiency, its energy is supplied via a wood-burning heating system with electricity from a combination of solar panels, a battery bank and mains supply where necessary. Wind turbines will come online once budget allows. DuPont™ Tyvek® breather membranes for buildings have been specified for the remote new ‘Rabothytta’ trekker’s shelter in northern Norway, designed by Jarmund/Vigsnæs to withstand the extremes of weather in the region. Svein explains that, based on a limited footprint, the functional design of the cabin is necessarily compact, but with very thick insulation on all sides. The construction enables scalable use of energy so that a smaller group can heat only a limited part of the cabin – crucial when consumables such as cooking gas and wood etc., have to be helicoptered in! The structure’s ability to cope with wind pressure is critical due to its proximity to a large glacier on one side and steep mountains on the other, with wind speeds of more than 200 km per hour not unusual. 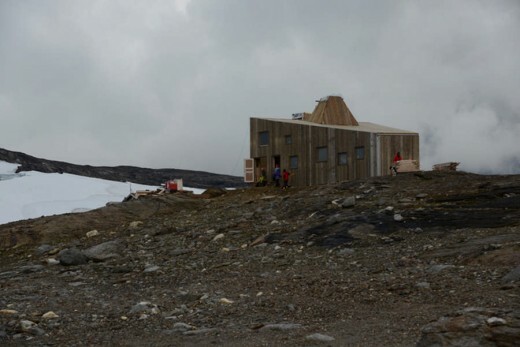 “Rabothytta” will be opened officially in August 2014, but Svein reports that interest is already extremely encouraging, both in Norway and abroad, and he believes that the new shelter will be among the most popular in country. The advanced and specialised DuPont™ Tyvek® breather membranes for this project were supplied by Isola, distributor of DuPont™ Tyvek® products for Norway, Sweden and Denmark (www.isola.com), specialized in solving moisture problems of buildings trade and supplying high-quality functional and up-to-date solutions for roofs, walls, floors and the ground. DuPont™ Tyvek® breather membranes for buildings have been specified for the remote new ‘Rabothytta’ trekker’s shelter in northern Norway, designed by Jarmund/Vigsnæs Architects to withstand the extremes of weather in the region. About DuPont™ Tyvek® (www.construction.tyvek.com) – Invented by DuPont research and development laboratories in the late ‘60s as a premium material for personal protection and packaging, DuPont™ Tyvek® is manufactured using a unique, proprietary technology, and has, over time been discovered and developed as ideally suited to a variety of further applications and markets. Around 1990, DuPont™ Tyvek® breather and water proof building membrane, already well established in North America, started to be applied in roof applications in a series of European countries. Between 1990 and 1995, it was successfully introduced into roof applications in Scandinavian countries, Switzerland, Germany and then to the United Kingdom. Today, DuPont™ Tyvek® is marketed in 35 countries in the Europe Middle East and Africa region, in addition to the USA, Canada and many other countries in the other regions. In 2005, the entire range of DuPont™ Tyvek® membranes achieved CE certification, the first to do so in the building membrane market. The DuPont oval logo, DuPont™, AirGuard®, Corian®, Enercor®, Energain®, FireCurb™, Plantex®, Typar® and Tyvek® are registered trademarks or trademarks of E. I. du Pont de Nemours and Company or its affiliates. Other logos, trademarks and registered trademarks are property of their respective owners.